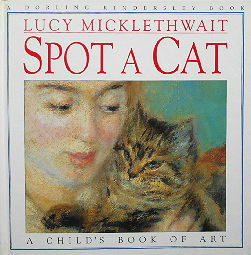 This children's cat book encourages children to a play a game "spot a cat". They are encouraged to look at the pictures closely and find the cat. The colored pictures are classic and contemporary painting that include the image of a cat. The hardback book is 8 3/4" square. Copyright 1995 First American Edition. 29 pages, full color throughout. Previously owned but in good condition.